J.J. Hardy is the star shortstop for the Baltimore Orioles. (He's the reigning gold glove winner with 52 homers the last two seasons and a former All-Star.) Brady Anderson was the Orioles star center fielder for 13 of his 15 major league seasons, where he was a 3-time all-star, and once hit 50 homers in a season. They are true baseball stars. But they are also pretty good at table tennis! 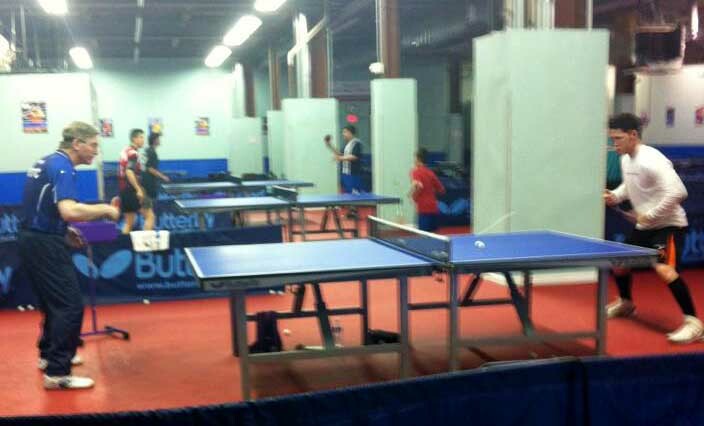 With the Orioles having a day off from playing, they spent four hours at the Maryland Table Tennis Center last night, 4-8PM. I gave them a private coaching session the first two hours, and then they hit with our local juniors. I knew in advance that JJ was the Orioles best TT player - they have a table in their clubhouse, and NOBODY beats JJ. Brady is their #2. But how good could they be, considering they hadn't had coaching? I was expecting "basement stars," perhaps 1200 level at most. Boy was I wrong! Both came with their own sponge rackets in racket cases. JJ's around 1850. Strengths: fast rallying and good serves, and adjusts quickly to opponents. Weaknesses: return of serve and against spin in general. He's very fast and aggressive at the table, with nice forehand and backhand hitting and blocking. He tends to hold his racket tip up on the forehand, which costs him some power, but his bang-bang rallying and reflexes allow him to rally at a 1900+ level - even better if you counter with him instead of looping. He also tends to reach for the ball instead stepping, which allows him to block but means he doesn't end the point as well as he could. He can loop against backspin from both wings, and follow with quick hitting. He has a surprisingly good forehand pendulum serve. He doesn't change his grip for the serve, and so loses a bit of spin since his wrist is locked up, but it's very deceptive. He does the serve from the forehand side, which seemed to make the serve more effective for him since most players do this serve from the backhand side. He has two main variations, side-backspin and side-topspin, and they both look similar. His depth varies (not sure if it's intentional, need to ask him), so some are long, some are short, and some are half-long, with second bounce right around or just past the end-line. He played a practice match with Tony Li, 11, rated an even 1800. Tony won the first two as JJ had trouble with his serves, but JJ came back to win, deuce in the fifth! You could pretty much see his mind at work as he figured out how to get Tony's various spinny serves back, and how to block his constant forehand looping. I also played JJ, and while I won easily, 11-3, 11-4, the key was that I was experienced enough to recognize how good he was at rallying, and so rarely let him get into a rally - I serve and looped everything, and looped his long serves while pushing his short ones back heavy, and looping the next ball. I wasn't going to be nice and risk losing!!! How did he get so good without coaching or playing at a club with top players? 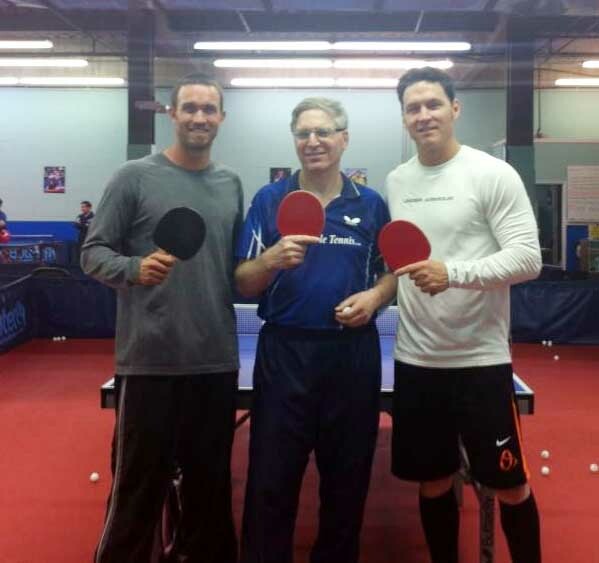 His dad was a tennis coach and good table tennis player, and he learned from him. He picks up things very fast, as I saw both in his lesson with me and his adjustments in his match against Tony. Brady Anderson was a level or so weaker, about 1500. He's a lefty who likes to cover almost the whole table with his forehand - he returned almost all my serves with his forehand. He has very nice footwork and range. He has a pretty good forehand, and can almost match JJ in rallies except that he has great trouble with JJ's serve. He can do a soft loop against backspin with his forehand. Brady also serves almost always from the forehand side, with a tomahawk sidespin serve, which was pretty spinny but without a heavy backspin variation, and so was easier to read than JJ's pendulum serve variations. He's very mobile, and even if you return his serve to his wide backhand, he manages to step around from where he's serving from on the forehand side to play his forehand from the backhand side. Brady tends to hit the forehand with his arm jammed in too much, raises his elbow as he hits the ball, and often tries to muscle the ball instead of relaxing the arm and shoulder and letting the body do the work. We worked on fixing these problems, and he was quick in making the adjustments in drills. At the start he had sort of a wristy backhand, but I quickly corrected it. While his backhand isn't as good as his forehand, it's technically sound once he made the change, though he'll need a lot of practice to ingrain the stroke. Brady has a deceptive forehand - he usually goes crosscourt, and then he'll suddenly change in mid-stroke and go inside out the other way, which was almost unreturnable, even for me. 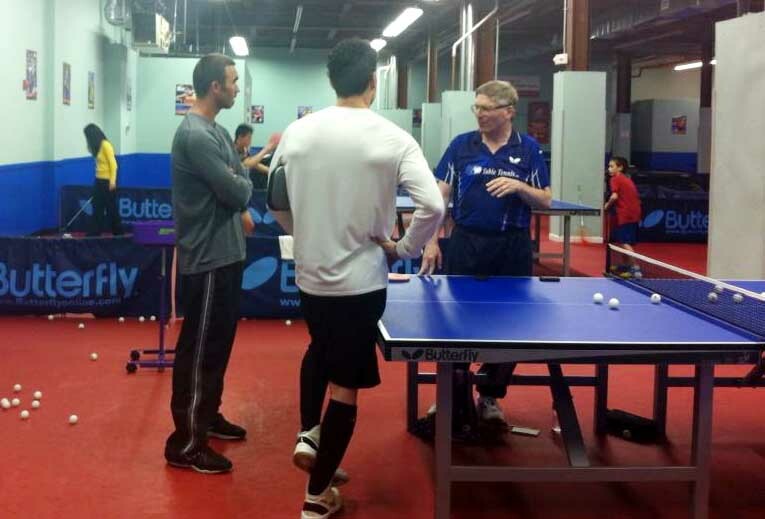 Brady also played a practice game with the 1800 Tony Li. Tony was very nervous, and Brady led 10-8 game point, but Tony won in deuce. Later Brady played 8-year-old Tiffany Ke, the #2 ranked Under 9 girl in the U.S. with a rating of 1439. (She trains seven days a week!) Brady was using the new racket and wasn't quite used to it, and seemed mesmerized that this little girl, whose head barely stuck up over the table, was so good, and so lost 0-3. (See their picture below.) I also played Brady, and I won 11-3, 11-1 - but a lot of that was because he couldn't get my serve back, and couldn't handle my spinny loops off his serves. Most 1500 players wouldn't have high-level serves or be able to loop serves, and so they'd rally - and once he gets used to his new paddle, Brady will be in the 1500 range again. It's tricky giving rating estimate for these two, due to their lack of experience against players with proper coaching. For example, while I estimated JJ at 1850, I'm taking into account how fast he adjusts and learns in each match - he'd probably often lose the first game and have to come back, and might even struggle at first with 1700 players. Brady holding up Tiffany Ke after she wins their match. They hit with many of our top junior players: Nathan Hsu (16, rated 2397), Derek Nie (12, 2215), Roy Ke (13, 2229), Princess Ke (11, 1954), Tiffany Ke (8, 1439, and Tony Li (11, 1800). They were great with the kids, and posed with pictures with all of them as well as signing autographs. I think JJ and Brady were as much in awe of the kids' skills as the kids were of them. By the end of their time at the club, they and the kids were having fun and talking like old friends. These were two very nice athletes; their stardom has not gone to their heads. 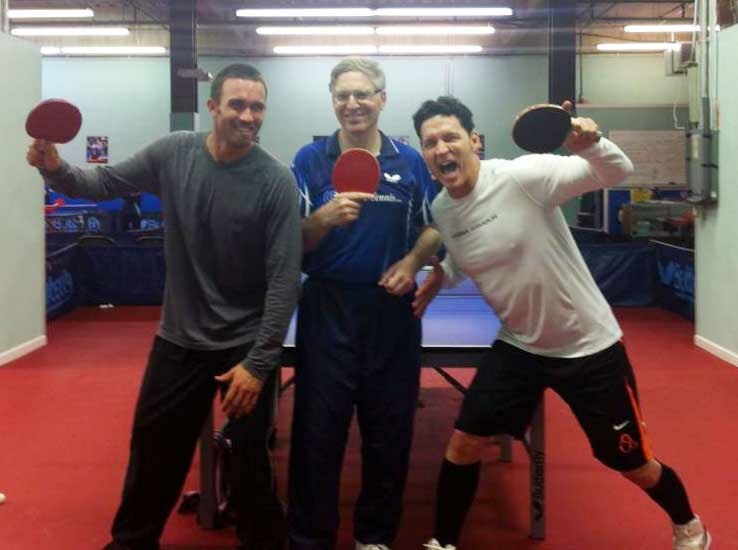 They were as excited about playing table tennis as a kid playing baseball. Both were interested in coming more often for lessons and regular play, but JJ can't because of the team's schedule. But Brady can, and plans to come regularly. I'm looking forward to working with him - once we've made a few adjustments on his forehand, I can already see him running around looping forehands. One interesting tidbit - when JJ was hitting with the 2400 Nathan Hsu, Nathan of course dominated with his two-winged looping. But when they played points, Nathan actually had trouble with JJ's serve. Part of this was because he was nervous, and wasn't expecting good serves. I told him to stop thinking about it and just react, and then he began looping them in. I also missed a few of JJ's serves at first, but then stopped missing them. I've been an Orioles fan since 1972, when I was 12, so it was an exhilarating experience hitting with these two. They were extremely nice, and very fast learners. When I made adjustments to their strokes, both picked them up fast, though they'll need more practice to ingrain the changes. You could see how their baseball skills transferred to table tennis with their fast reflexes and ability to learn new skills quickly. Both could react to my best smashes and loop kills. They didn't most back, but they got their rackets on them over and over, and JJ made some nice blocks. Some of you may remember Brady's range as a center fielder. Well, you could see both when he ranged around playing his all-forehand game, and when I taught him how to lob. He'd never done this, but he picked it up very quickly, and with me smashing at 80% speed to his forehand he was not only lobbing ball after ball, but he began counter-smashing, making the shot over half the time. I gave them both autographed copies of three of my books: Table Tennis: Steps to Success, Table Tennis Tales and Techniques, and Table Tennis Tactics for Thinkers. They gave the kids autographed copies of baseball cards, and offered free tickets to games. We'll take them up on that sometime soon. All in all, a great day at MDTTC. The kids have a great story to tell at the school, as well as lots of pictures.